There was something chilling in the air that night. Koichi, Viet, Sean, and myself (Mami) were making our way from JR Kichijoji Station to have dinner at an izakaya. I trailed behind the group, a little nervous about the meal ahead. After all, this wasn't a happy-go-lucky Japanese restaurant, like the ones with singing frog men. 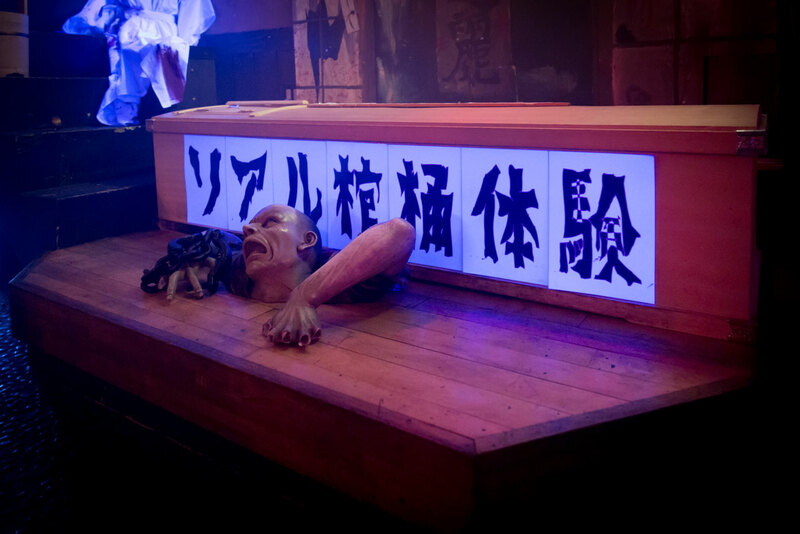 This was a spooktastic, haunted restaurant called Kichijoji Yūrei 吉祥寺 遊麗（） ("yūrei" means "ghost" in Japanese). After only a few minutes (it's quite close to the station), we arrived outside. It was well-lit with a big white lantern and floodlight. Immediately, I knew something horrible lurked within. The ghost hovering above the staircase looked welcoming enough, though. Everyone went through the archway but me. I lingered for a moment, wondering if I could sit this one out. Rain began to hit my jacket. Was it an omen? Either way, it pushed me inside. I'd rather be haunted than wet. Everyone was kindly waiting for me at the door near the bottom of the staircase. Bizarre lights poured in through opaque windows. Koichi stepped aside an urged me to go first. My trembling hand pulled it open and I peeked inside. "Konnichiwa…?" I said in a quiet voice. "Irasshaimase!" A voice called out cheerfully from the dark and creepy interior. I perked up, confused and encouraged by the happy-sounding voice. Opening the door wider, I saw a cute ghost waitress. "Oh, didn't you realize?" Dorami laughed. "You left your bodies on your way here. You've all become 'floating souls.' No human body can enter here." 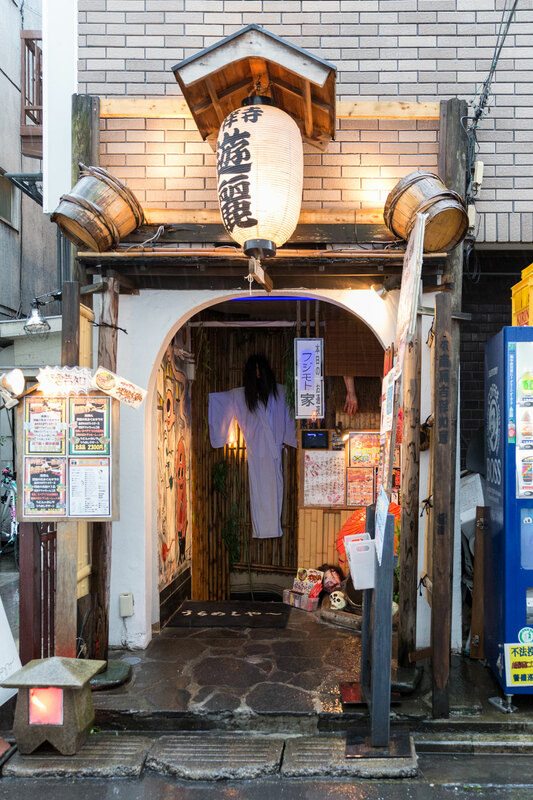 "Welcome to Kichijoji Yūrei, the izakaya in the spirit realm. My posthumous Buddhist name is Dorami. I'll be your waitress today," she said, smiling. I was so relieved! Instead of a horrifying, decrepit yūrei like Sadako, we got a cute, bubbly ghost with the same name as Doraemon's sister. "Cute ghost cosplay," I said along with a relieved sigh. Dorami giggled. "Thank you, but this isn't cosplay. I'm really, truly dead." She turned her head and looked directly into the camera. "It's been three years since I passed away. In life, I loved melon bread so much that I choked on it and died." I was taken aback, surprised by the coolness in her voice. But Dorami didn't notice my reaction and continued. "We have a lot of food, drinks, and rituals to entertain you human souls during your stay." Koichi raised an eyebrow. "Wait a minute. What do you mean by 'human souls?'" Dorami stared at us for an uncomfortably long time, smiling. We chuckled at the joke to fill the silence. "Ha ha ha," said Koichi. 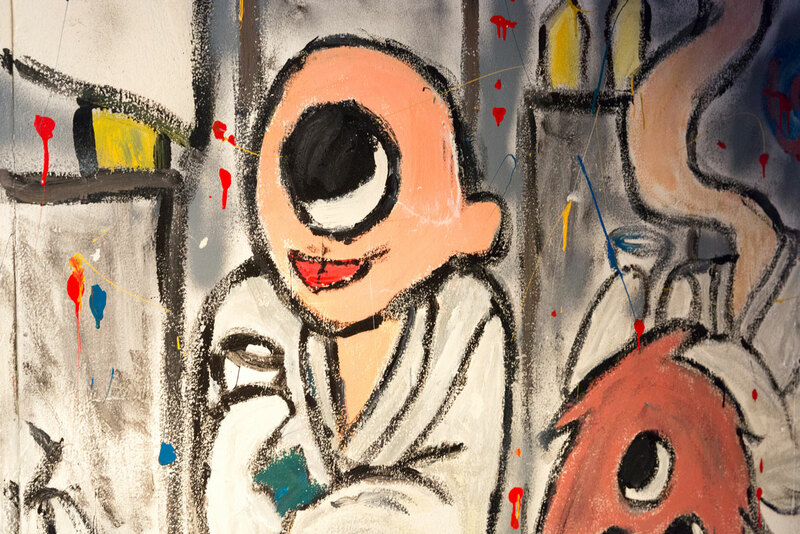 "Right this way," Dorami said moving further into the restaurant. As we entered, we passed by a bar. Above it were gravestone (decorations?). Dreary music floated on the thick air, altered by a smoke machine hidden somewhere. This place sure had the whole "realm of the dead" motif down pat. 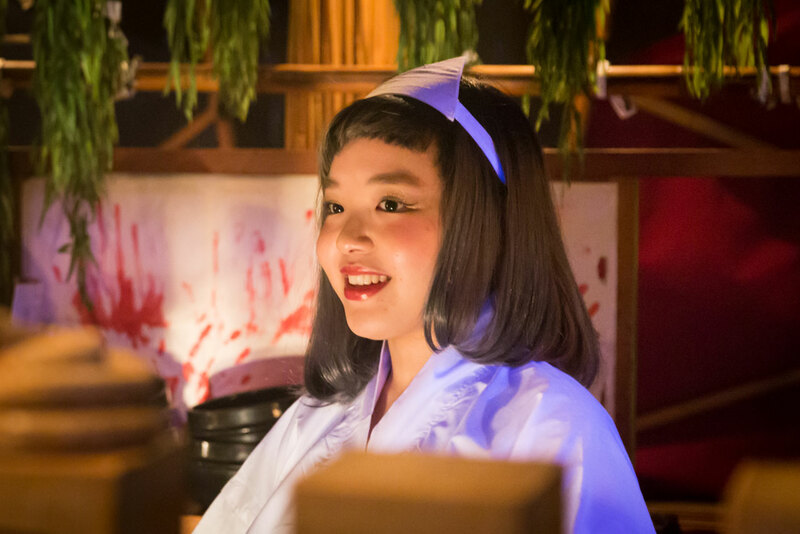 As we approached our table, Dorami grabbed a bleeding, severed hand and placed it against her cheek. "If you need service, call a waiter over by raising this hand and ringing the bell." She did that uncomfortable silence thing again. "Anyway, take your seats." 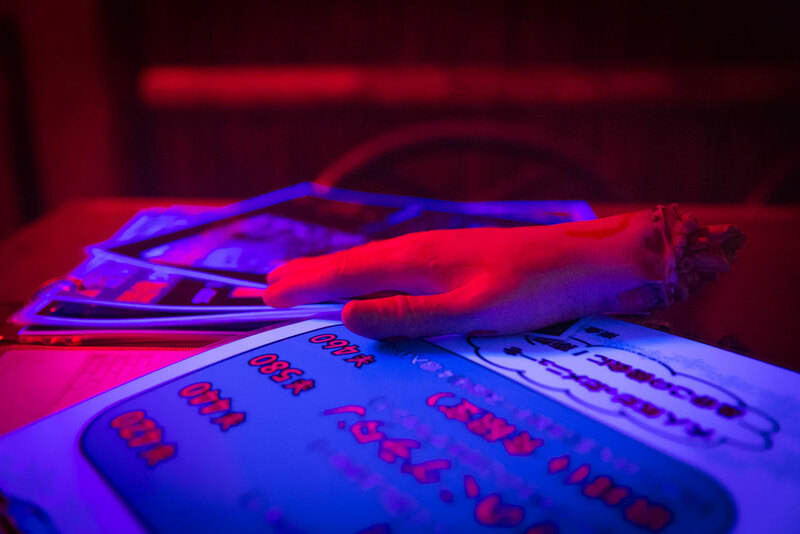 She put the hand down on a stack of menus emitting an eerie green light. They were written in some kind of glowing ooze, which was convenient for us because it was so dark in the restaurant. "Any drinks to start?" Dorami asked. I was definitely feeling the need for alcohol at this point. "What do you recommend?" I asked. "The most popular drinks are our original cocktails," Dorami answered with a grin. "We have ten ghosts working here and ten cocktails, each one relating to the causes of our deaths. If you choose me, I'll mix the cocktail at your table while describing how I died." Again with the creepy smile. "Oh, cool…" Koichi said. "But you already told us how you died when we came in. You choked on melon bread." 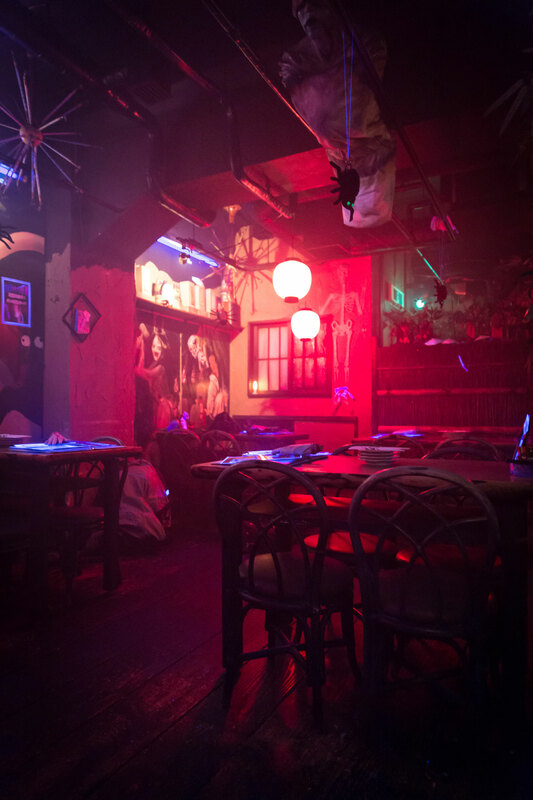 "We have ten ghosts working here and ten cocktails, each one relating to our causes of death. If you choose me, I'll mix the cocktail at your table while describing how I died." "Ah, that's right!" Dorami stamped her foot. "Well, I guess you could order one of our shōchū bottles. But there's no descriptions of demise with those…"
"That's fine. Tell us about the shōchū," Viet said eagerly. "We have a sweet potato shōchū called 'Makai e no Izanai,' a wheat shōchū called 'Enma,' and a shiso shōchū called 'Tantakatan.' If you can't finish the bottle, we keep it here in your own personal tomb until you come back." "The shiso one sounds good," Koichi answered. I think he ordered the least scary sounding drink available because he was afraid. In hardly any time at all, Dorami was back with the bottle of shōchū in one hand and wooden tablet in the other. "Is that an… ihai?" I asked nervously. Ihai are Buddhist mortuary tablets and ours said "Tofugu no Reii トーフグ之霊位（）" which is "Tofugu" plus the honorific title that goes after a name of someone who's died. "Yes, it is," said Dorami excitedly. "We use these to decorate the table when customers make a reservation. You can't take it home, but it's cute, isn't it?" We smiled awkwardly as we looked at the ihai, all of us probably imagining the death of our company and all our co-workers, though maybe I'm projecting a little bit, here. After sipping our drinks a while, Dorami returned. "Have you guys decided on any food?" "Uuuuhhh…" We'd been so busy drinking, we hadn't really looked at the menu. "Do you have any recommendations?" I asked. Of course she did. "Our most famous dish is cremated spare ribs. If you order that, we call Enma, the Judge of the Afterlife, over to your table and he cremates the meat right in front of you. 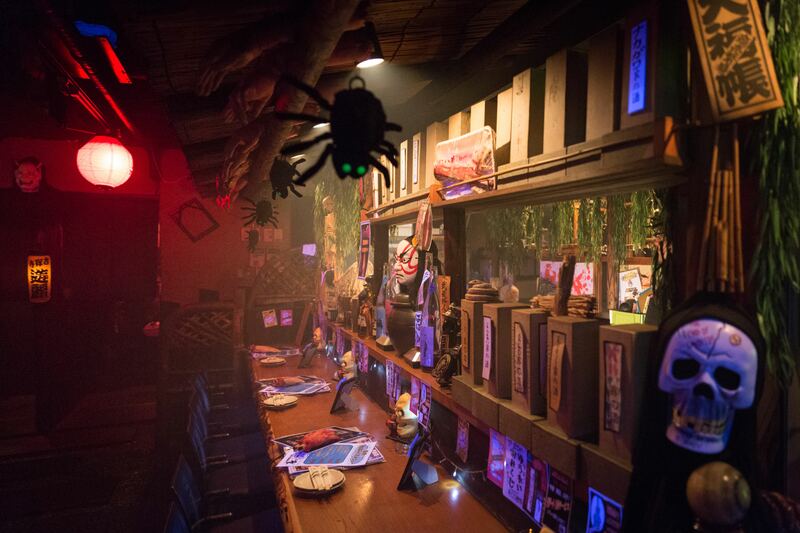 "There are lots of other tasty treats too, like cheesy eyeballs, an umbrella yōkai-themed hanpen, and deep-fried sausage and quail egg skewers arranged like a cursed straw doll. "I also recommend the gratin with poisonous mushrooms and the fried tofu prepared to look like a Japanese gravestone. It's called 'ohakamairi' because you pour sauce on top of it like when you clean a real gravestone during a visit." I have to admit, the dishes didn't sound appetizing what with all the rotting flesh I imagined was in each one. But I knew it was just the theme of the restaurant and the food (probably) didn't have any dead people in it. "Can we have one of each?" Koichi ordered for us all again, taking charge like a boss who was hungry. "Sure!" Dorami answered happily. In a moment, her expression changed. "Oh, I completely forgot. There's also the Russian Roulette." "What is that?" asked Viet. 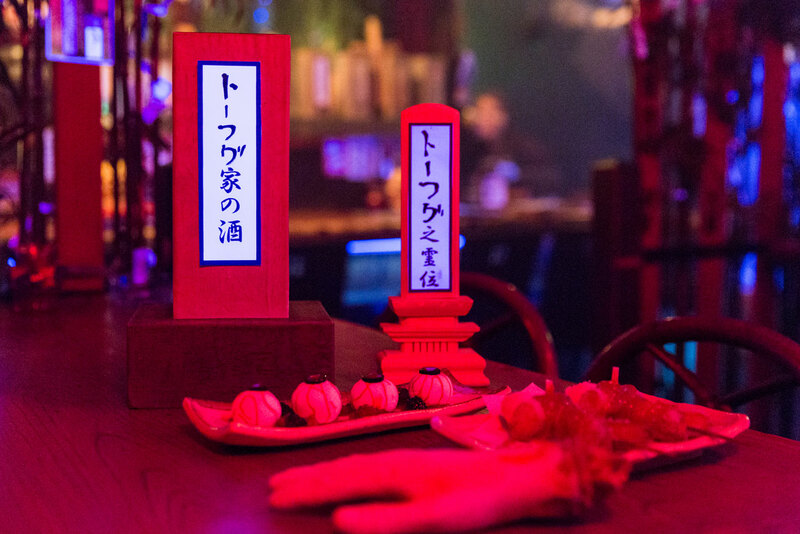 "You can order a game of Russian Roulette that you play with skewers of kushikatsu. The loser joins us ghosts and gets to rest in the coffin over there." She pointed to a coffin in the corner of the room. "Are you guys up to the challenge?" "Let's do it!" Sean answered excitedly. Maybe it was the atmosphere, but it seemed we were all growing accustomed to the macabre. Or maybe it was all the shōchū we'd been drinking. Even the spiders started looking cute, and I hate spiders. Maybe the curses were affecting our eyeballs, because all the food looked delicious. Finally our food arrived. As Dorami set the plates on our table, she said, "Enjoy! We put a lot of curses in the food for you." "I thought you guys were friendly ghosts," I chuckled. "We are," said Dorami. "Our curses make the food taste extra good." Maybe the curses were affecting our eyeballs, because all the food looked delicious. Enma did an especially great job cremating the spare ribs with hellfire, but my favorite was the umbrella yōkai-themed hanpen; not only was it clever, it had bacon strip tongue which I claimed for myself. After more drinking, eating, and drinking, Dorami came by to check on us. "How is everything?" she asked. We were having a blast and we told her so. "I'm glad to hear it," she beamed. "Sometimes human souls get so scared down here that they go all the way back up to the human world just to use the restroom." "You don't have a restroom down here?" Sean asked. "Oh, we do, but some human customers find it too scary." "This I gotta see," Sean said, getting up from the table. Sean's verdict: "Yeah, it's pretty creepy." He slid back into his chair. After seeing the video, we all went to check out the bathroom and it was even more grotesque in-person. We only poked our heads in to take a look, but I wonder what it would be like to spend a long time in there (you know, like after a big meal). I feel like the bleeding, fleshy walls all around you would make it difficult to make any progress. Shortly after our bathroom adventure, Dorami returned to our table holding a small pot. Inside was four kushikatsu skewers, one for each of us. We'd completely forgotten we'd ordered the Russian Roulette. "Time to play!" Dorami exclaimed. "One of these kushikatsu contains a very dangerous sauce that will turn one of you into a ghost like me." We fell silent for a moment before smiles crept across our faces. "Everyone please pick one skewer each," Dorami urged. We slowly reached our hands in, hesitating. Suddenly, I grabbed a skewer. Then there were three… two… one. Viet was the last to grab a kushikatsu. Dorami smiled, "Okay, everybody got a kushikatsu? One of them has a sauce that will take you straight to hell. Ready?" We nodded, first to each other then to Dorami. Slowly and quietly, Dorami spoke, "Ready, set… GO!" We all popped the kushikatsu into our mouths. Chewing, our eyes darted around the table, wondering who got the hell sauce. Finally, Viet sat back and yelled, "Aw man!" We knew who had lost. In a flash, a ghost costume was thrown over Viet and a funeral march began to play. We walked him to his coffin and laid him inside. He was so young. "Goodnight, sweet prince," I thought. As Sean laid a flower by his friend, the box began to move. Suddenly, Viet was up and about again. He had risen from the grave! "Maybe he's still attached to the human world and couldn't die," Dorami suggested. "Is there something you left unfinished in the human world?" "There's a pull request I need to review," Viet answered as he sat back down at the table. We all laughed, relieved that Viet's soul had returned to us. With that, we asked for the check. After almost losing a colleague, we figured it was time to reclaim our bodies before any other ghostly shenanigans locked us in iron maidens or something. Thankfully Dorami accepted our corporeal money and let us go. We didn't finish the bottle of shōchū we ordered (though we certainly tried), so it's being kept at Kichijoji Yūrei in our personal tomb until we go back. "It was wonderful to meet you," Dorami said, waving goodbye. "Come again sometime." She led us to the door and we left the ghoulish wonderland behind. I took one last peek at the restaurant and smiled. It was a great time with great food, but unfortunately we all have to go back to the human world eventually. Definitely come with a group for maximum fun factor. +1 point for Viet dying. I died and was laid to rest here. 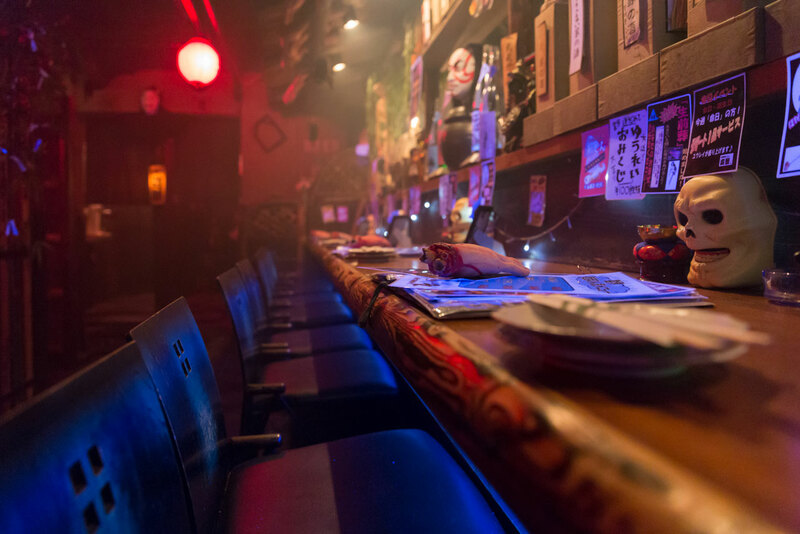 It was a fun ghost-themed izakaya with friendly staff. Their food was designed well, and the taste was good too. I think the price was pretty reasonable.